The global thin and ultra-thin films market is expected to witness steady growth in the coming years according to Transparency Market Research (TMR). Currently, the vendor landscape of this market features immense consolidation. 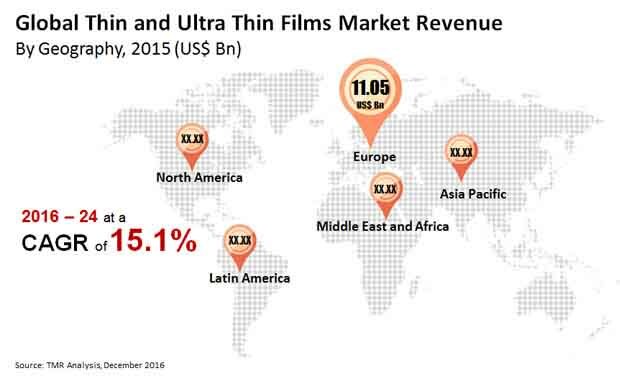 The top vendors operating in the global thin and ultra-thin films market are E.I. du Pont, Kaneka Corporation, and Corning Incorporated. Leading vendors are seen focusing on research and development of novel, innovative products. Having a product with superior performance in their portfolio is the leading trend that vendors are capitalizing on to retain market traction. Other than this, players are expanding their technological base, and obtaining product patents. There is a high demand for flexible batteries, which has become a target market for this industry. Prominent vendors in the global thin and ultra-thin films market are Ascent Solar Technologies, China National Building Material Company Ltd., Moser Baer India Pvt. Ltd. and American Elements. As reported by TMR, the global thin and ultra-thin films market is prognosticated to rise at a 15.1% CAGR over the forecast period 2016 to 2024. The market was estimated to be worth US$32.78 bn in 2015 and is expected to reach US$115.41 bn by 2024. On the basis of end-users, the segment of thin film electronics garnered high revenue in the base year. The segment is expected to remain lucrative over the forecast period on account of the burgeoning electronic goods industry. Based on region, the global thin and ultra-thin films market is expected to be dominated by Asia Pacific, bolstered by the boom in consumer goods in the region. The landscape of adaptable battery market is set to explore with the developing nearness of IoT. As one of the quickest developing application section, IoT helps the development of adaptable and compact gadgets, which thusly supports development of the adaptable battery market. BrightVolt and Enfucell Oy focus on the production of batteries for IoT wearables, restorative gadgets, and smart cards. It is evaluated that, at present, more than one billion battery-powered Li-ion cells are created every year to take into account the demands of the electronics market alone. It has been evaluated that later on years, the demand for these thin and ultra-thin films will additionally build attributed to the utilization of these films in the aviation and defense industry. This is expected to fuel the global thin and ultra-thin films market. Internationally, thin film material assembling organizations are reliant on the administration subsidizing and sponsorships. The recuperating worldwide economy comb edwith the stringent government control and subsidizing from investors is evaluated to give the market a fundamental lift later on. Additionally, the consistent demand for innovation by a few noteworthy players to pick up the favorable position is boosting the market for thin and ultra-thin film. Besides, ascent in scaling down in hardware industry, semiconductors and rising demand for sustainable power source assets is boosting the growth of thin and ultra-thin film market. The rapid growth of microelectronics fragment is the significant driving component for the development of global thin and ultra-thin film market.